This article is a roundup of innovative landscape and architecture projects from our friends at ArchDaily, “the world’s most visited architecture website.” ArchDaily is dedicated to informing and inspiring architects worldwide to improve the quality of life for an estimated three billion people who will move into cities over the next 40 years. One of the United States’ most polluted bodies of water is about to receive a much-needed makeover: In early 2014, construction will begin on a pollution-preventing greenscape that will run alongside Brooklyn’s Gowanus Canal. The proposal, dubbed Sponge Park, was envisioned more than five years ago by Susannah Drake of dlandstudio, and has just now “soaked up” enough funds to move forward. Phase one of the $1.5 million proposal, which is expected to be complete in the summer of 2015, will begin near Second Street. A multiuse park lining the polluted canal will be anchored by soil-filled concrete cells that will retain and filter stormwater, while topped with plants capable of soaking up excess water and naturally absorbing or breaking down toxins, heavy metals, and contaminants from sewage overflow. For more images and design plans, see the article at ArchDaily. Sponge Park design. Photo by dlandstudio. Sponge Park. Photo by dlandstudio. 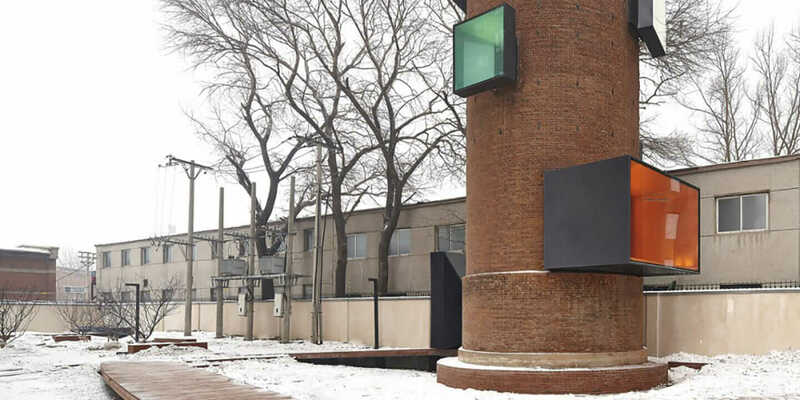 META-Project, a research-design studio based in Beijing, China, renovated a dilapidated water tower for China VANKE Co., Ltd. in Shenyang, China. From the architect: This water tower is located in the campus of a run-down military factory, which was previously known as the People’s Liberation Army No.1102 Factory, founded in 1959 during the Great Leap Forward. Formerly one of the most important heavy industrial production bases of China, the Tiexi District in Shenyang is now full of miscellaneous industrial relics from that time period. Water towers scattered around the city have become visual anchor points in the ever-shifting reality of this region. The transformation around this particular water tower began starting in 2010. VANKE acquired the campus of this military factory, converting it into what is called the Blue Mountains residential complex project. Along with the decisive construction of the surrounding cities, the water tower has remained well preserved—functioning partially as a reminder of the fragmented memory of the history of industrialization, as well as serving as a projection of unexpected public use in the future. For more about META-Project’s Public Folly project, see the article at ArchDaily. Public Folly project. Photo by Chen Su. From Studio MK27, a small architecture firm based in São Paulo, Brazil: An urban house resting like a monolith over the garden; a single cubic volume housing every function and opening and closing to the outside. Each design has small, very simple rules that give the structure its form. The rule here was to inhabit this pure volume, building openings wherever necessary and considering climate conditions. The common area is therefore an open space, like a rip in a concrete box, totally integrated with the garden. The cube-box is rebuilt on this floor using metallic panels—made of perforated sheets—that can be opened all the way. When closed, this system gives the room privacy and shade. When open, indoor space becomes an extension of outdoor space. For more about Studio MK27’s Cube House project, see the article at ArchDaily. Cube House project. Photo by FG+SG—Fernando Guerra.